How to transfer any format videos to your iOS7 device? 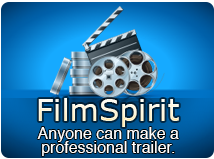 Current Page: Home > Tips > How to transfer any format videos to your iOS7 device? Have you already updated to iOS 7, or get new iPhone 5s? 4Media iPad Max Platinum is fully compatible with iOS 7, iPhone 5s and 5c now. 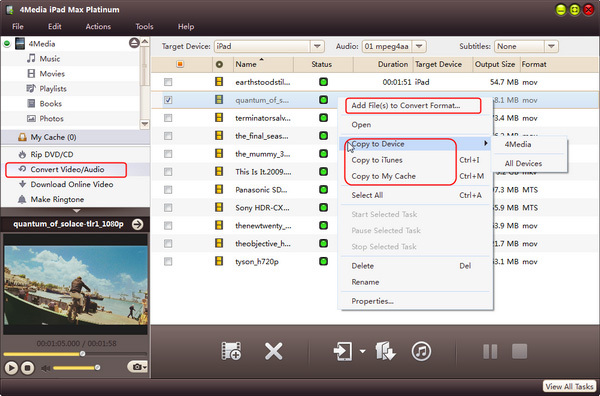 With this iPad/iPhone/iPod management tool, you can transfer DVD movies and any format videos to iOS7 devices easily. Launch the iPad/iPhone/iPod management tool and here we go. Select "Convert Video/Audio" node from the left directory tree, and click "Add File(s) to List" drop-down button to load video/audio files or a folder from the drop-down menu. If you add device-incompatible files to the "Convert Video/Audio" node, the software will automatically convert them to the format you set. Check one or more videos and audios you want to transfer in the file list, and click "Copy File(s) to Device" button to start copying. If you connect more than one device simultaneously, then the "Select Copy Destination" dialog box will pop up to ask you to choose the target device(s) you need. After a few minutes, you will be able to enjoy media on your iOS 7 device. With this 4Media iPad Max Platinum, you can transfer videos to iOS7 device easily and also transfer media files between iPad/iPhone/iPod, PC and iTunes. Let's have a try.